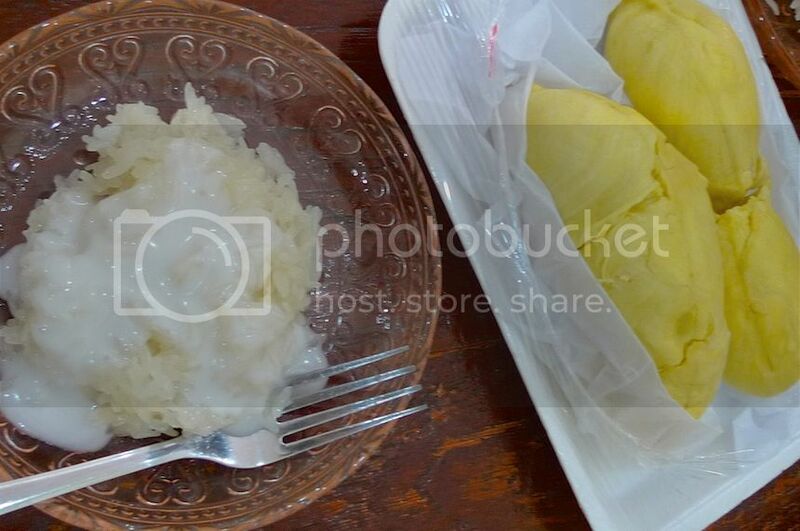 My Very First Blog: Yummy Coconut Sticky Rice With Durian At Boonsap Thai Desserts! 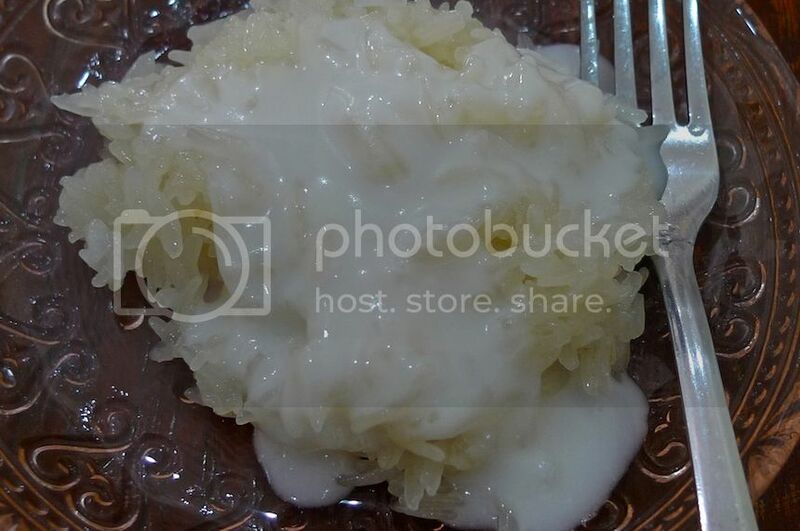 Yummy Coconut Sticky Rice With Durian At Boonsap Thai Desserts! After our breakfast of roasted duck at Prachak Pet Yang, I immediately brought my Filipino friend Ishmael over to Boonsap Thai Desserts. I had been craving for my favorite Thai dessert, coconut sticky rice with durian and I knew I just had to eat it! 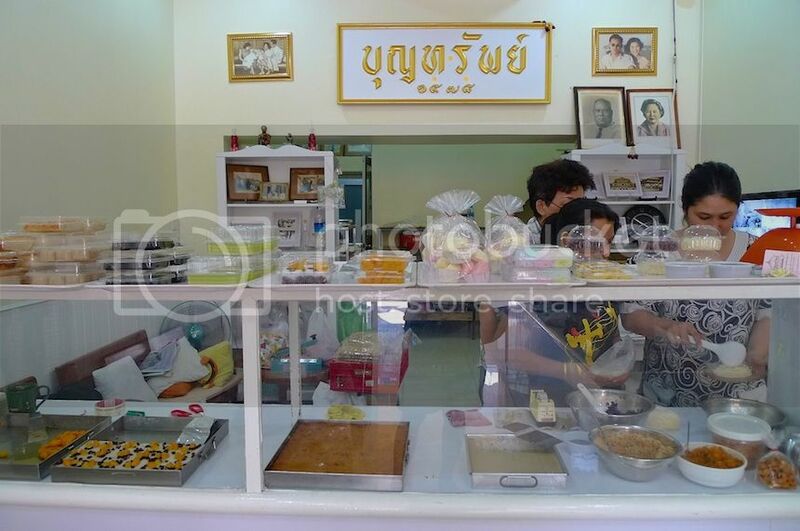 Located somewhere across the road from Prachak Pet Yang (and same row with Robinson Bangrak), this famous Thai dessert shop has been around since before World War 2. 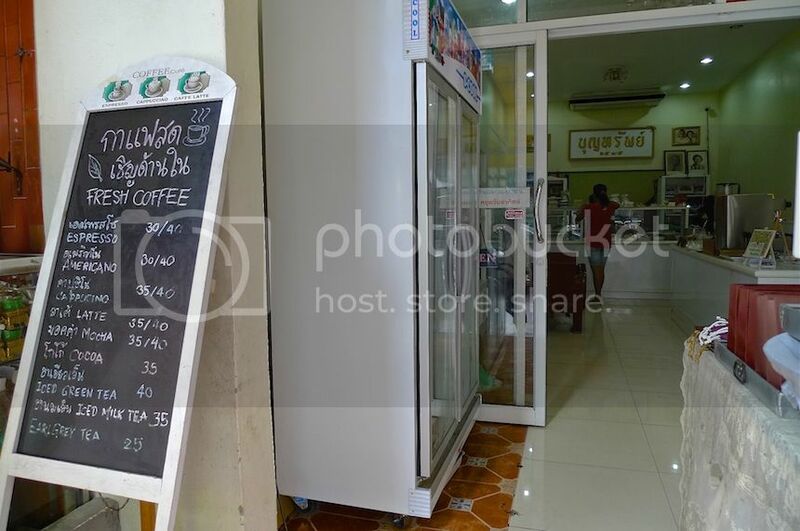 Now run by the young third-generation owners, the shop has been renovated to resemble a small cafe complete with air conditioning and two tables. I noticed from the outside that they even serve fresh coffee! Didn't remember seeing that last time - either that or I did not pay attention. As soon as we stepped into the shop, the first thing I asked was whether they have coconut sticky rice with durians. I saw this pot of coconut cream and already started salivating haha! Unfortunately, the lady boss (I think she's the owner) told me that they had ran out of durians. 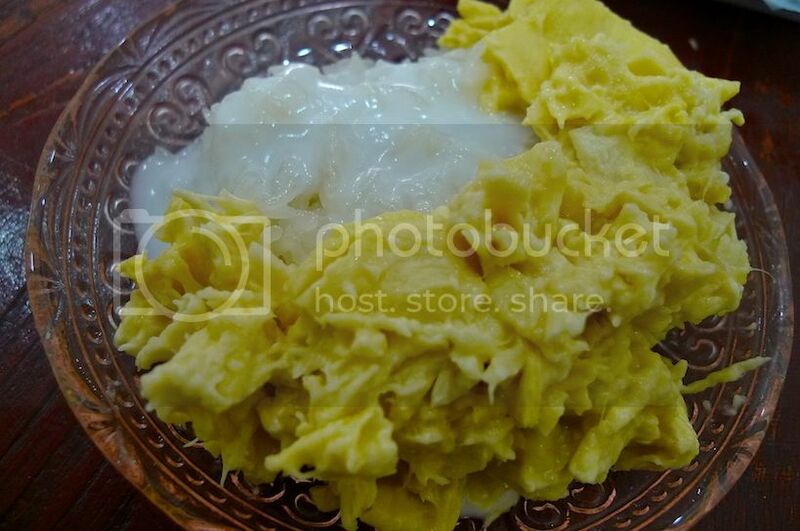 I could choose sticky rice with mangoes instead (highly recommended if you happen to dislike durians). Or I could go buy some durians from the fruit stall a few shops away, she suggested. So guess what? That's exactly what we did! Ishmael and I went over to the fruit stall and bought a box of pre-packed durians in styrofoam container for 100 baht (US$3.20 / RM10.20). 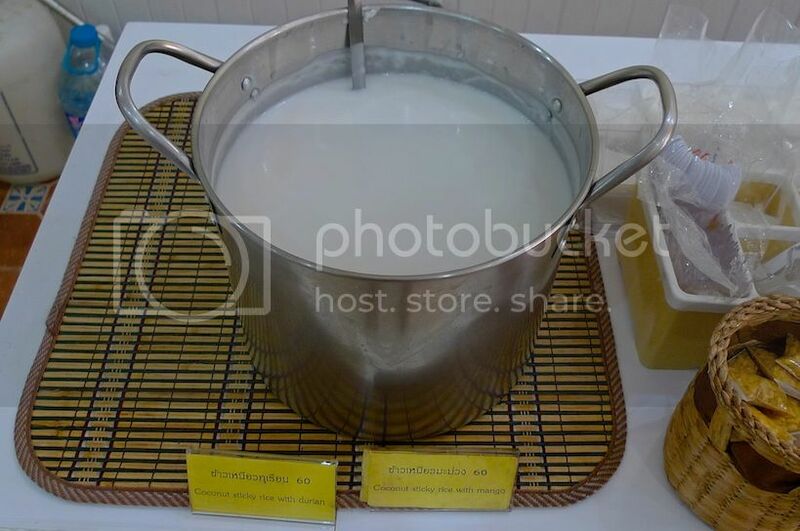 Then we brought it back to Boonsap Thai Desserts where we were immediately served 2 bowls of coconut sticky rice for 25 baht (US$0.80 / RM2.55) a bowl. We placed the durians we had just bought on the table in the middle. 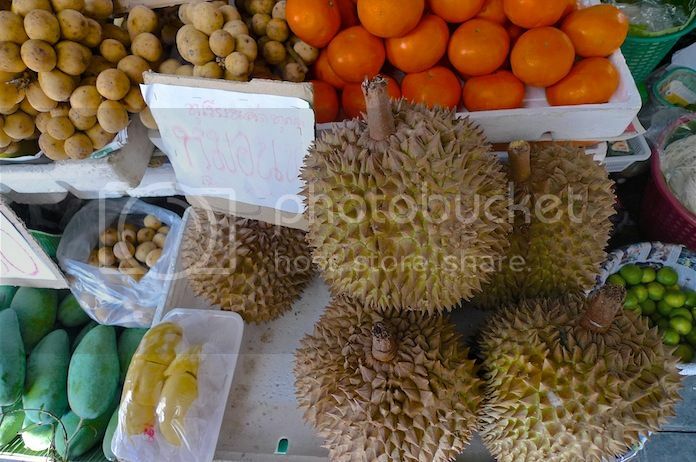 I know Thai durians are not as aromatic as Malaysian durians but I would not let that bother me LOL! After our bowls of sticky rice were slathered and drowned in rich sweet coconut cream, it was time to add in the durians! 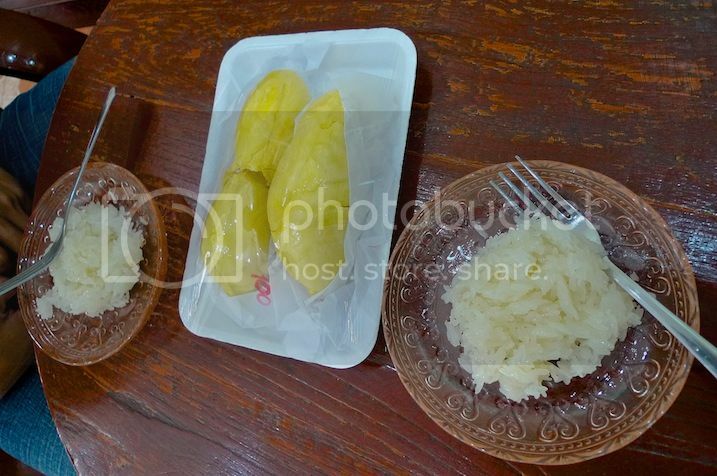 With the use of forks and spoons, we managed to scoop out the yellow durian flesh and placed them onto the sticky rice. 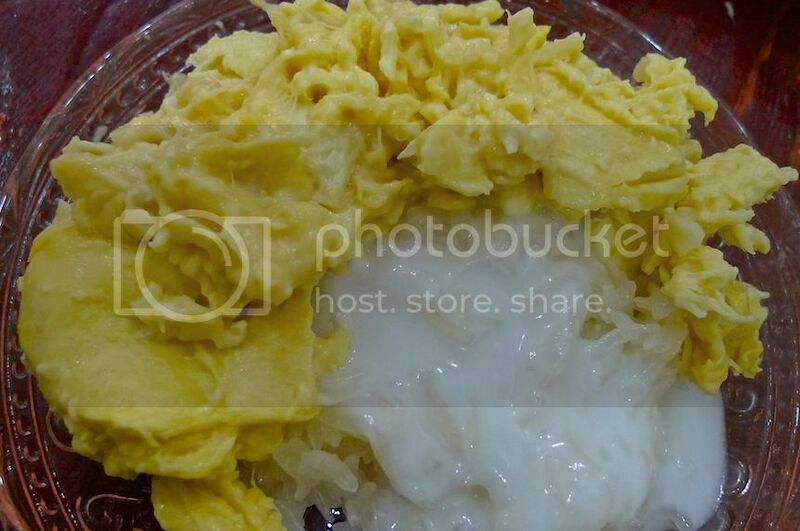 My bowl of coconut sticky rice with durian ended up looking like this. LOL! I don't think you will be able to buy a bowl of sticky rice with durian anywhere in Bangkok with this generous amount of durians haha!! Anyway, both Ishmael and I totally enjoyed this yummy dessert! The combination of durians, coconut and sticky rice is totally awesome! If you have not eaten it before, do give it a try! Warning : If you hate durians, you will hate this dessert!! 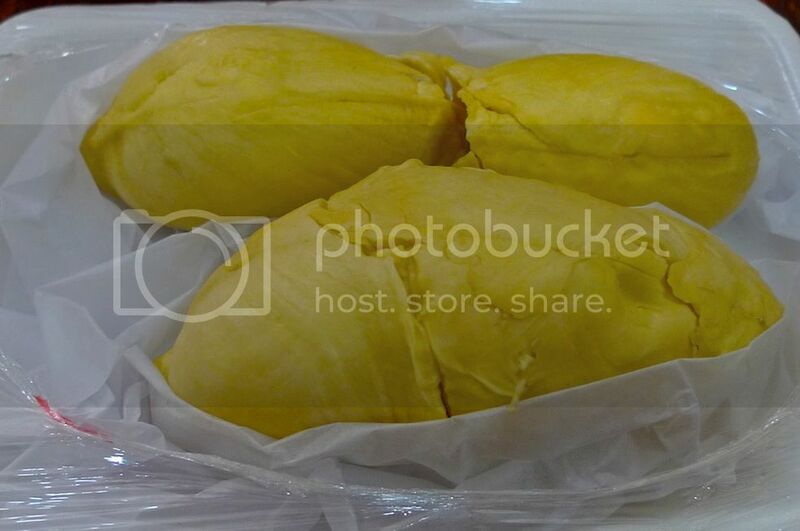 But you can replace the durians with mangoes and it will taste almost as heavenly! We did not try other desserts in the shop as we were already quite full. 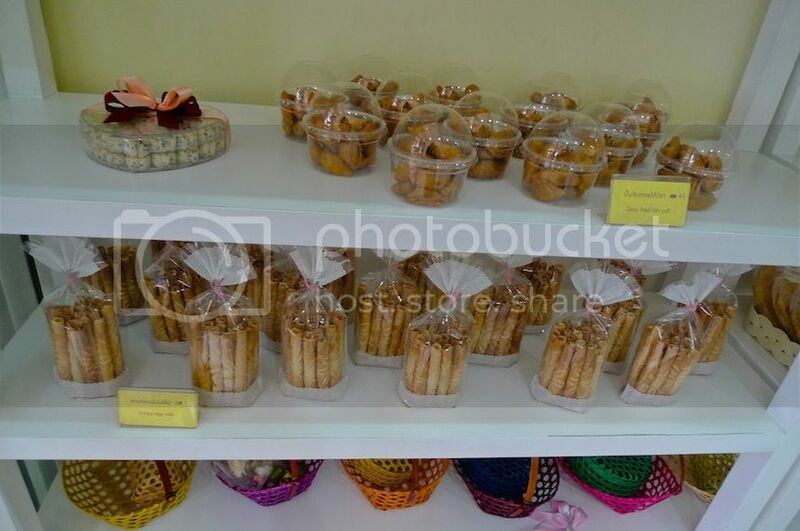 Boonsap has many other varieties of desserts to choose from. I still remember the sticky rice with creamy steamed egg custard that I ate here last year - it was so yummy! But no, I did not touch that this time. Spotted this dessert and was tempted to try it, but did not. There were some cakes and cookies on the shelf. There were many more desserts I did not take photos of. 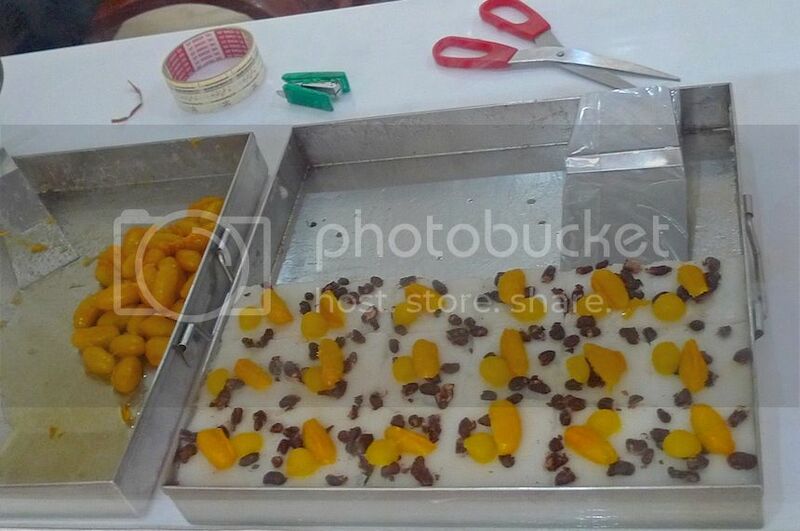 Right outside the shop, there was a stall selling all the various types of desserts. I think I must really visit Boonsap Thai Desserts again the next time I go Bangkok and try all their traditional Thai desserts! 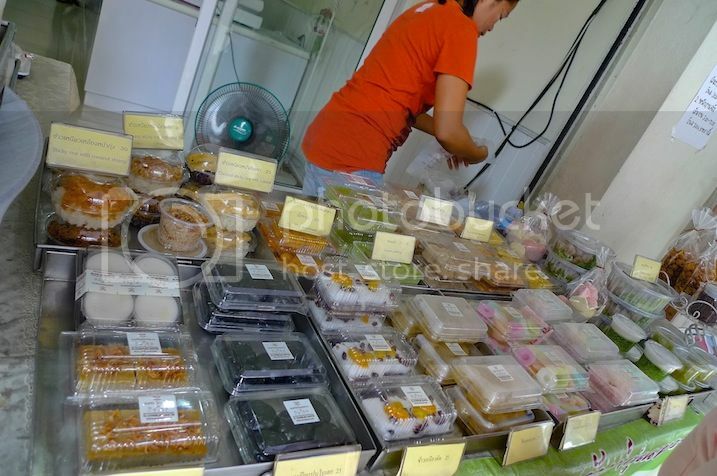 Directions to Boonsap Thai Desserts : From Saphan Taksin BTS Station, walk northbound along Charoen Krung Road. 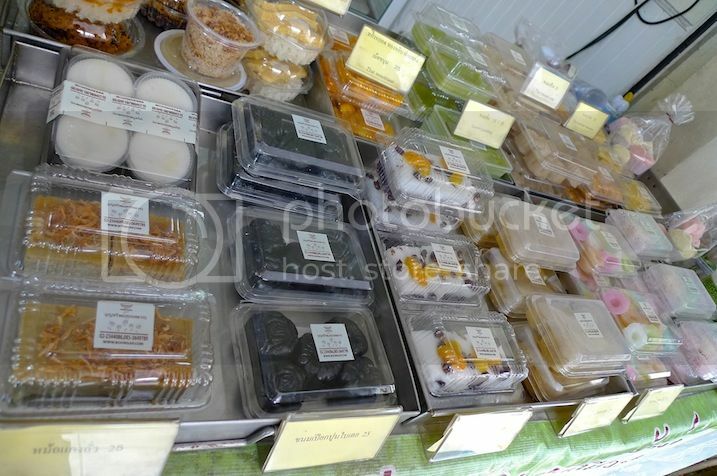 After passing Robinson Bang Rak on your left, continue to walk straight and you will find Boonsap Thai Desserts amongst the shops on your left.